Your body isn't meant to be at a weight that it can only sustain through restriction. Intentional weight loss was invented by diet culture, which I define as a system of beliefs that equates thinness to health and moral virtue, promotes weight loss as a means of attaining higher status, and demonizes certain ways of eating while elevating others. We’ve all heard that statistic that 95% (or more) of people who pursue intentional weight loss gain back all the weight they lost within five years, and the majority of those people will gain back *more* weight than they had initially lost—and that’s because our bodies were designed to protect us from famine. None of us would even BE here if it weren’t for this mechanism that kept our ancestors from dying when food was scarce. So what about that other 5% (or less) of people who do seem to maintain intentional weight loss, you might ask? Unfortunately, the research indicates that they do so through disordered means that, if diet culture didn’t deem them "success" stories, could be diagnosed as an eating disorder. They’re not meant to be weight-suppressed—none of us are. Our bodies aren't meant to live in perpetual restriction, which wreaks havoc on our mental and physical health. 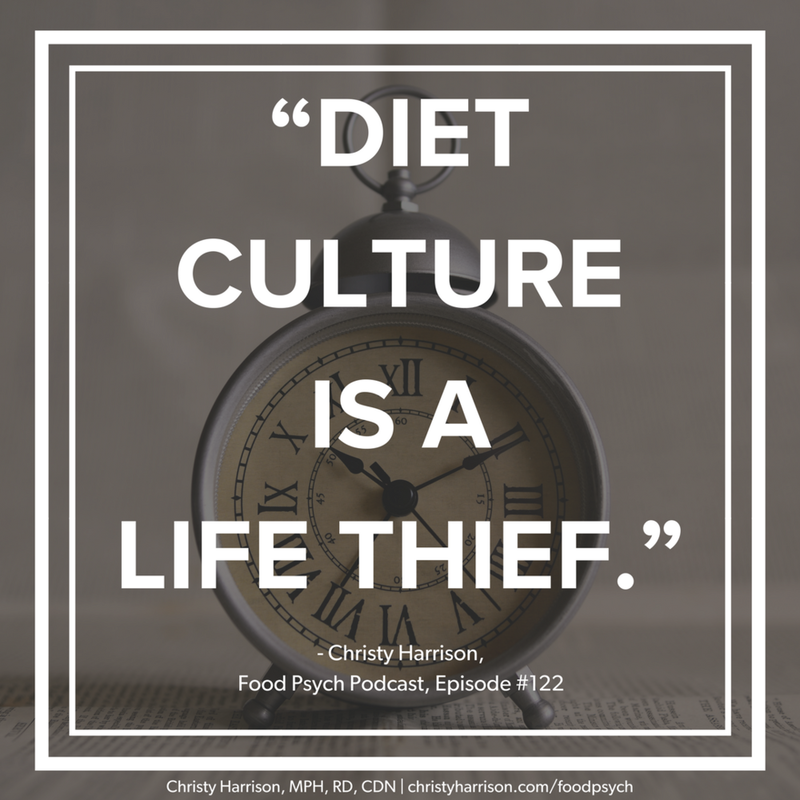 Diet culture is a life thief; when we’re caught up in it, food and body preoccupation take up so much real estate in our brains that pursuing any other life goal can feel nearly impossible. Diet culture takes away our passion and drive. It prevents us from being fully present in our relationships and our work, because thoughts of food and body are constantly humming in the background. Diet culture tells us we aren't good enough day in and day out, and sells us products to “fix” ourselves—products that research has demonstrated fail 95% or more of the time. And yet somehow we still feel we’re the ones to blame. That's the most insidious thing about diet culture—making us feel like failures, when in reality the system is rigged so that no one ever actually “succeeds." Diet culture drives us to passively restrict our eating and our pleasure, and can even push us into disordered eating and eating disorders. Do we really want to spend our entire lives fighting against our bodies and trying to force them into a certain shape or size through restriction and deprivation? Do we want dieting to steal any more of our precious time on this planet? Do we want our life’s work to be the pursuit of weight loss? Or do we have more important, fulfilling, and fun things to do with our time here? From where I sit, the answer is clear. We all deserve SO much better than to have our lives stolen by diet culture.